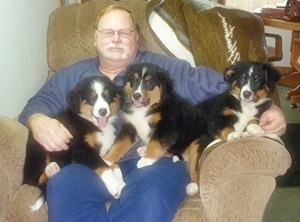 The last part of the year was busy, as we took in 4 dogs in December. 3 were small mix pups and another just 7 months old Then we took in a 7 year old female in February. We also asked for help getting a young male out of the Alpena Shelter. 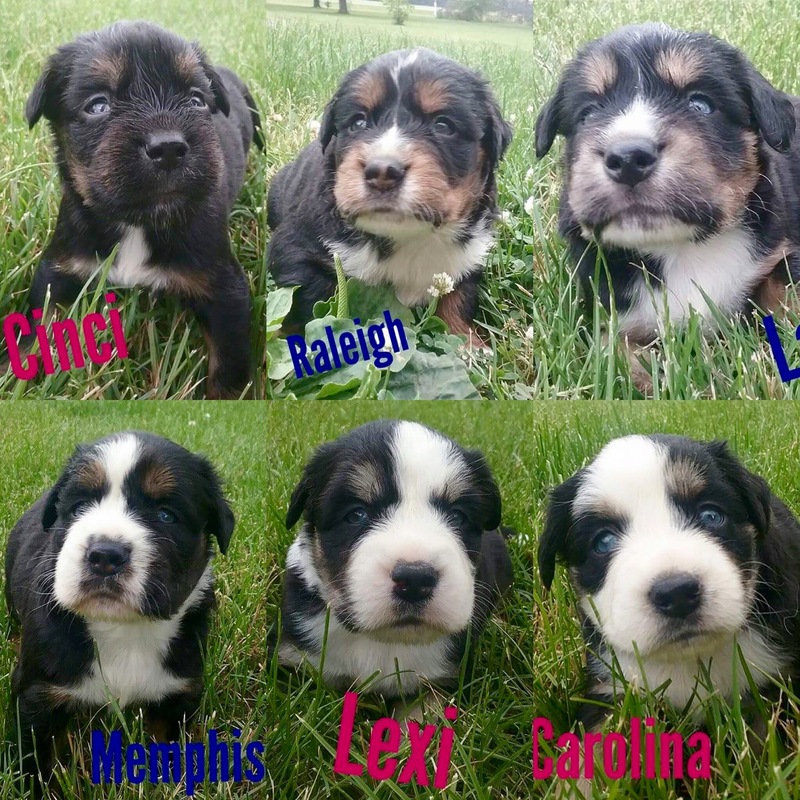 Cascade, Alpine and Ridge were the mix pups, mixed with Australian shepherds. 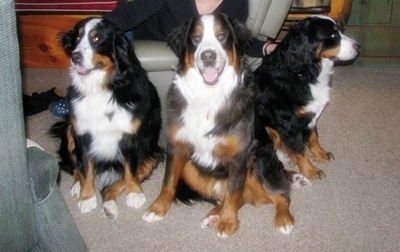 There were 6 total and we took the 3 that looked more like Berners. 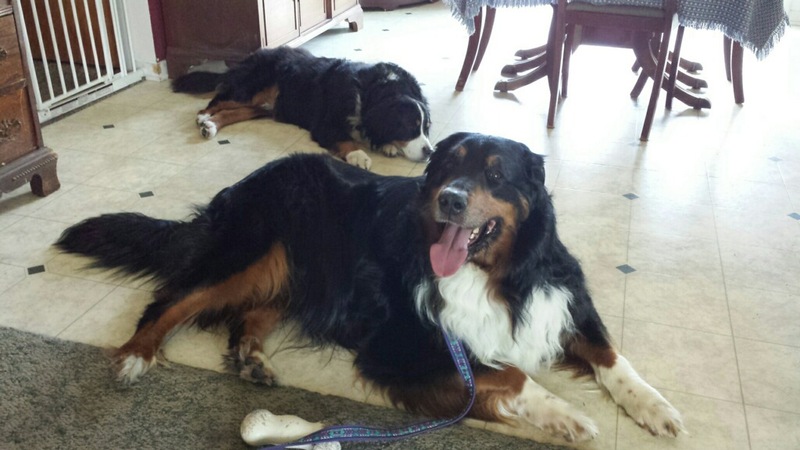 These dogs were from a puppy-mill in Indiana that April VanBuren was contacted about. I told her we don’t do mixes and she contacted Vilma Briggs who reluctantly agreed to take them but said she was being overrun with fosters. 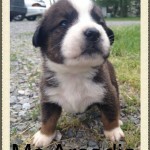 So I agreed to take 3 and the other 3 went to a rescue April had worked with before. The pups were about 12 weeks old, very cute and somewhat timid. They quickly learned that people were OK and loved our gang, but kept play mostly with each other. We had always talked about getting a pair of pups to raise together sometime. We are over that kind of thinking now. Three little, crazy, active, poop and peeing machines was much more work than we realized. I know why breeders say they are glad to see them leave. They were a lot of fun and we got attached, and when they left they were very sociable. Cascade, now Charlie, lives just 20 miles from where he started in Indiana, Ridge, now Lochlan lives an hour south of Toledo, OH, and Alpine, now Dexter Lives in Waterford, MI. 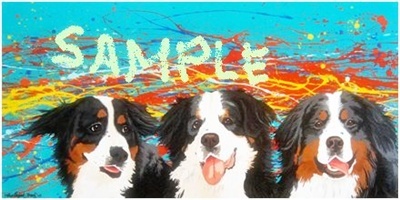 It was amazing that all 3 homes send us e-mails telling us the each puppy was the best puppy they had ever met, and were so smart! I guess we were good foster parents for them. 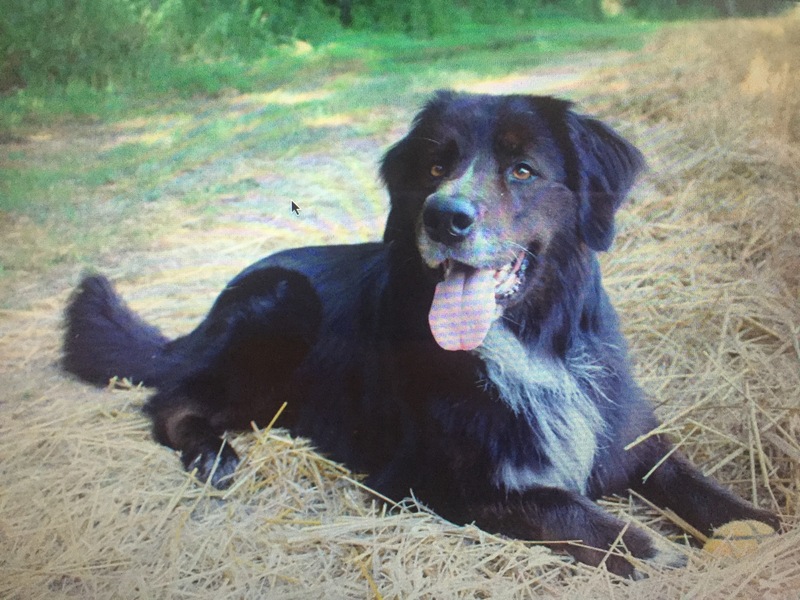 Seeker, came from a home in Milford, MI. 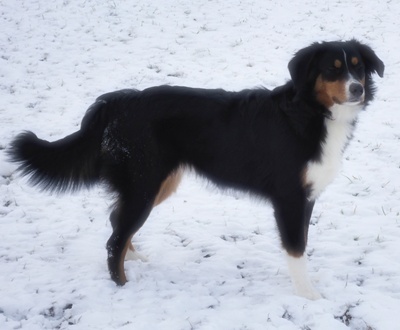 His owner contacted us saying her was too much for her as she had recently broken her arm in a fall. When I picked him up I found that his life consisted of a maybe 4 foot square area at the end of the island in the kitchen on a very slippery floor. He was very shy and I could not touch him while at their home. He was so very skinny with no muscle tone and he walked strangely. When I got him home he self contained himself in a corner of out dining room where he was surrounded by furniture, so he had his safe spot. It took several days for him to finally come out into the dining room, then a few day to the living room with us. There he discovered the dogs beds and that was it for him. He found heaven. He has learned to trust us and loved rough housing with Rigel and Hoagie. His strange walking was from his standing on a slick floor with n o exercise. So much so that his tendons on the inside were tighter that the outside causing his feet to rotate inward. After about 6 weeks of playing his walking became almost normal. 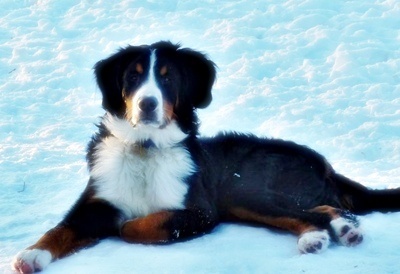 He had so little exercise; his pads were still puppy soft and were getting cut on the snow when he first came until they got toughened up by playing. Seeker really attached himself to me. He followed me everywhere, and would sleep on my lap, so the affection became mutual. Seeker would have stayed with us if he did not have the compulsion to eat toys, blankets, socks, pillows, but mostly our gang’s stuffed toys. We had to puppy proof the house and ultimately had to crate him when we were gone. His adoption got delayed several times because he ate something and we wanted to make sure it passed before he went to his new home. 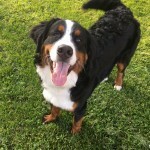 He now has a 1 year old Berner buddy to beat up and lives in his new fenced yard in Ohio. 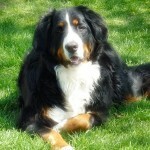 Heidi is 6 ½ years old and the people decide they could not keep her or it turns out did not want to keep her. They wanted me to get her ASAP so I met them in Birch Run, as they lived west of Saginaw. I had a bunch of questions to ask but lost all train of thought when they pulled up in their pick up with Heidi in a crate in the back of the OPEN pick up at is was only 15 degrees out!!!! I don’t know why they did not have her inside of the extended cab. 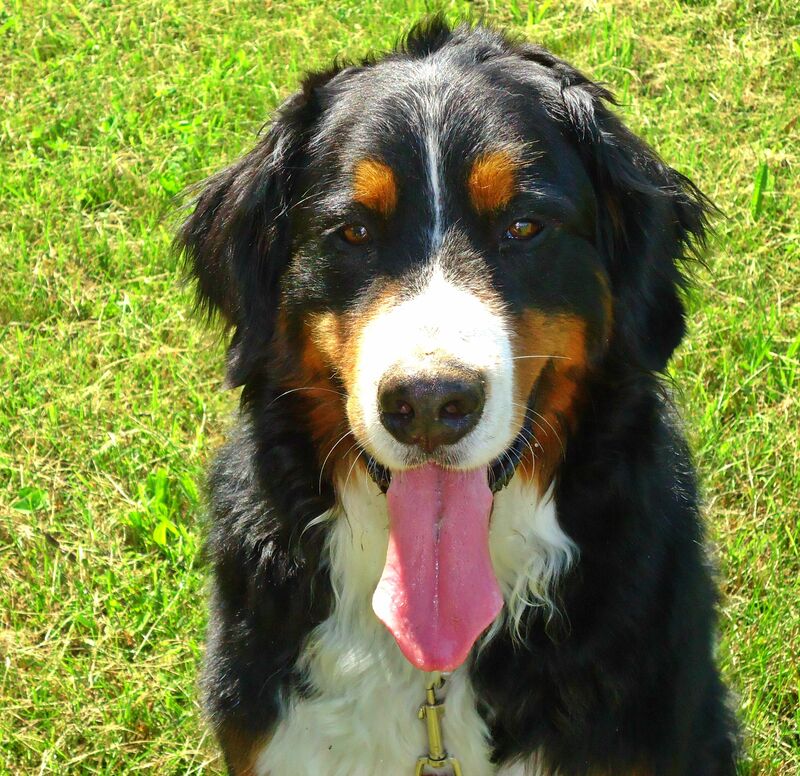 Heidi is very friendly and outgoing, sat immediately on my feet and lick my hands. So I loaded her into my warm vehicle and left after getting things signed, forgetting to ask questions about her. She is a very sweet girl with an obsessive need to nibble on something or lick us when she get on some sort of furniture with us, especially the bed. Again, she has attached herself to me. She had a knee repaired some time ago and either the knee or her hips bother her when she sits. She loves her toys and teases everyone running around the yard showing me her toys, but plays keep-a-way with us. We are working on a home of some club members for her forever home, hopefully it will work out, the family is great, just no fence but have one in the pans for this spring. tail!!! 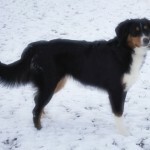 He is a Berner/Aussie mix, confirmed, but is 95% Berner (just missing a tail and has a big diamond Swiss kiss), in looks and personality. So Patty, fell in love and big hearted Brad, said “just keep him”. Done! 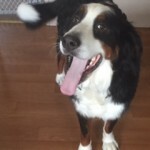 Home found! No foster needed!! Maggs is a lucky boy! 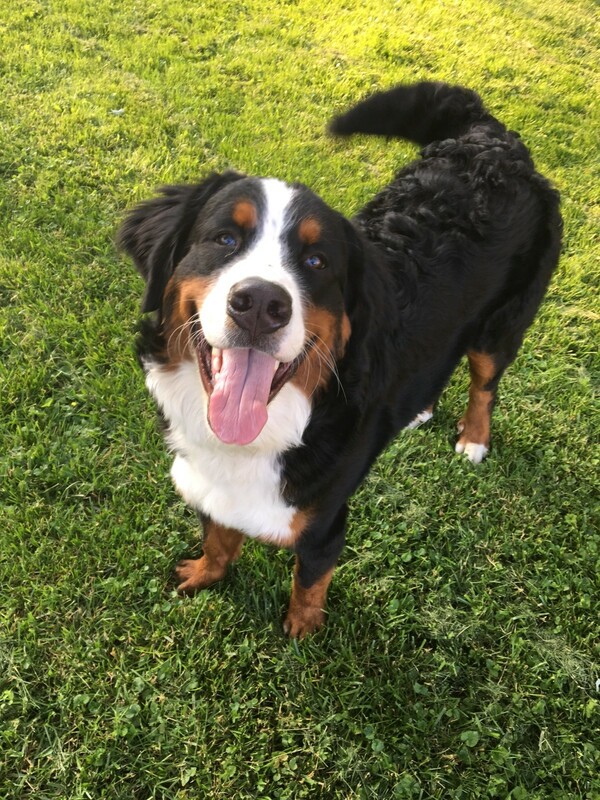 He was tested and came back as having heartworms. 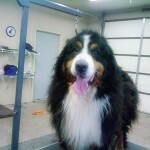 So he is being treated once his weight gets up to where it should be. Keeping him quiet will be difficult as he already has the routine down to go crazy running with Trina and Skye on their 600 acres. He is a perfect match for Trina as he can keep up with her on the daily runs, and can even almost match her bounce! Once again the downfall of fostering, you fall in love. 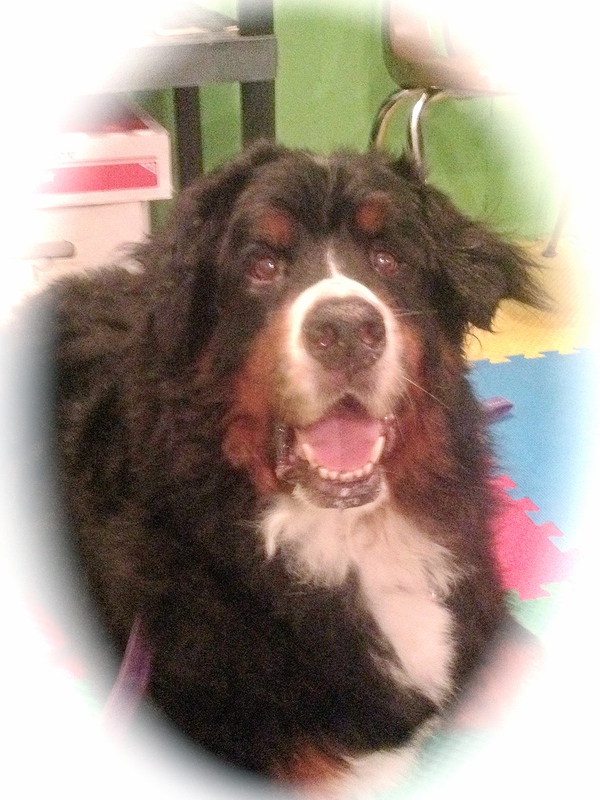 We know Maggs could not have a better life and family. I hope they adopt me next. 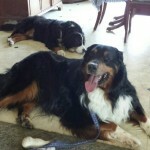 As I write this there are 2 missing Berners, one in the Marshal and one in Torch Lake. We are keeping fingers crossed that they are found healthy and safe. 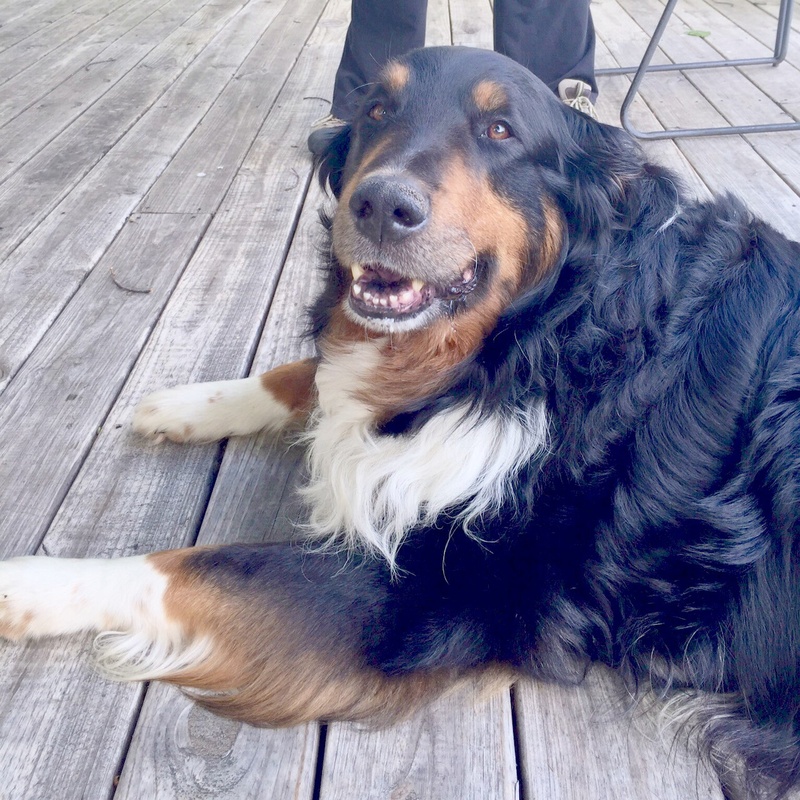 It is thought the Torch lake dog may have been stolen. Once again we are preparing for the DCK show in Detroit. We have an 8 foot booth for our Breed Education/Rescue table. We have solicited help from club members to assist this year so there will be some new faces helping get the word out on our great breed. Thanks to all that have offered to help! After the last batch from the puppymill in the last quarter, we were hoping that things would slow down, but not a chance. We had about 2 weeks after finishing up placing the last 5 and more started coming in. 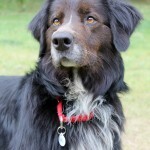 Plus Toby got returned for an incident in his new home. 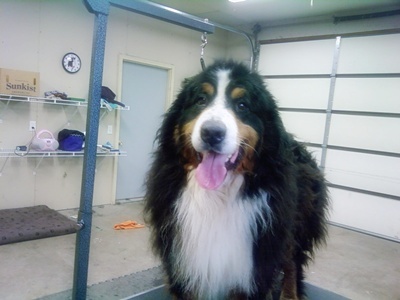 Toby has a fear history and the new owners were supposedly experienced in having dogs with some fear problems. Well, they didn’t. Toby got scared one evening after being there a month and they were very happy with him. They wanted him to go outside, he apparently heard something and ran back inside. They grabbed at him to drag him out and he snapped at the son. He did break the skin, but it did not even need a bandage. Then 2 days later, he got a live chicken and brought it in and hid under the bed with it, protecting it. He was growling and would not come out. So what did the experienced new owners do? They called animal control and signed him over to be put down. We found out 2 days later that he was turned in. We had to do some fast talking and convincing to get the owners to sign him back out, but we got it done. April and Coral VanBuren met us in Kalamazoo at the shelter and they took Toby home with them to work on him. April spent many days working with Toby and found him to be the sweet dog we knew he was. So April spent over a month working with him and finding his strengths and how to control his fears. 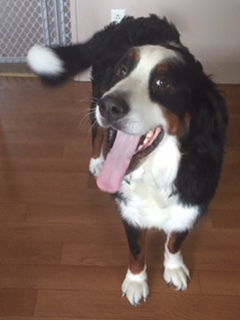 We were able to find him another home at have a Berner and are willing and looking forward to working with April to continue Toby’s training. We owe April a huge Thank You for taking on Toby and saving him from himself. 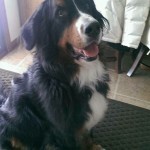 Keep your fingers crossed that this is Toby’s “forever home”. 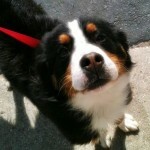 Within the 2 weeks of rest we got several calls from people having Berners that need homes. We took in Sadie and Ripley the same day and then drove to Traverse City to get Koda. Then a week ago Gracie #3 came to us. 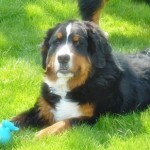 Sadie was gotten at 13 weeks by her owners and they never took her to the vets, not once in almost 16 months. When she was about 5 months old she started to chew on things (DUH! 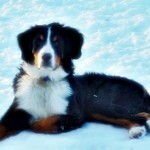 !, she was losing her puppy teeth and teething), so the put her outside where she spent the next year. The finally decided that she would do better in a new home. Sadie was intact and when they dropped her off she had blood on her neck, but they did not know from where. We found that her ear tips had been eaten raw by flies and were bleeding every time she shook her head. She was spraying the walls with blood, she was a mess. We are still working on getting them to heal. 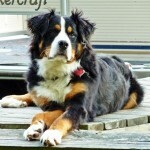 Sadie should be going to her new home mid October with another Berner. She is super sweet and wants all the attention she can get. She gives the very best hugs. She actually squeezes you with her paws. 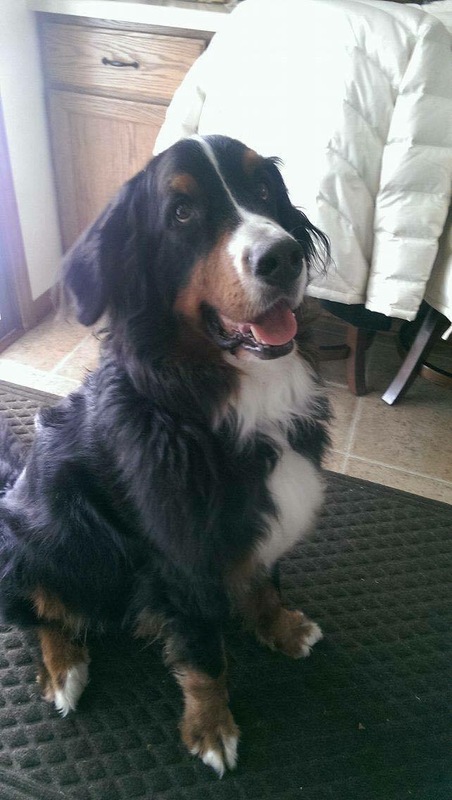 She has white socks almost up to her elbows and a shorter coat, but she is all Berner. 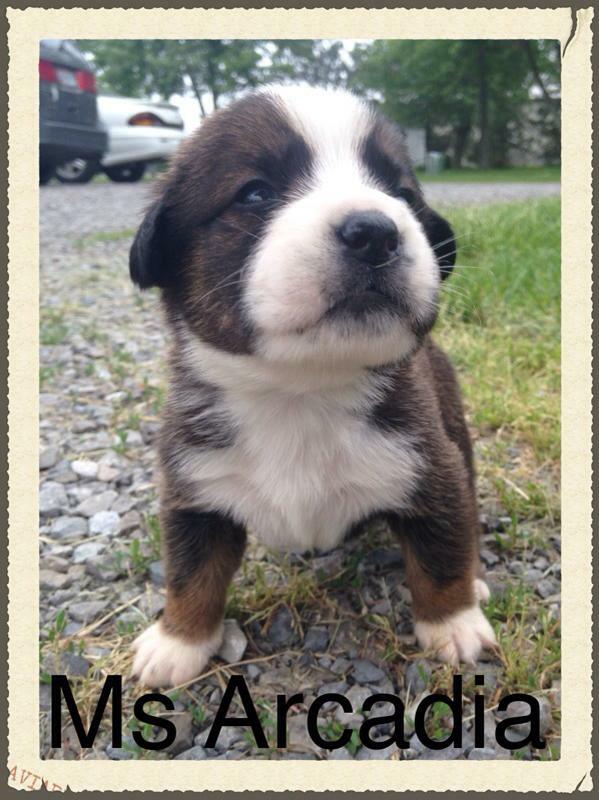 She was from an Amish Breeder. Ripley, that’s the name we gave her. She was found somewhere in “northern Michigan”, but I can’t seem to get the story pinned down as to where. I kinda doubt the story but have no way to find out if she was missing from anywhere. 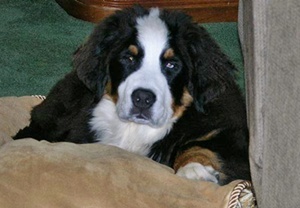 I posted to the yahoo group and searched ads for a missing Berner but no one was looking for her. She was about 5 months old and supposedly found wondering. We estimated her to be about 5 month old due to her teeth and when she stared losing them it was confirmed. 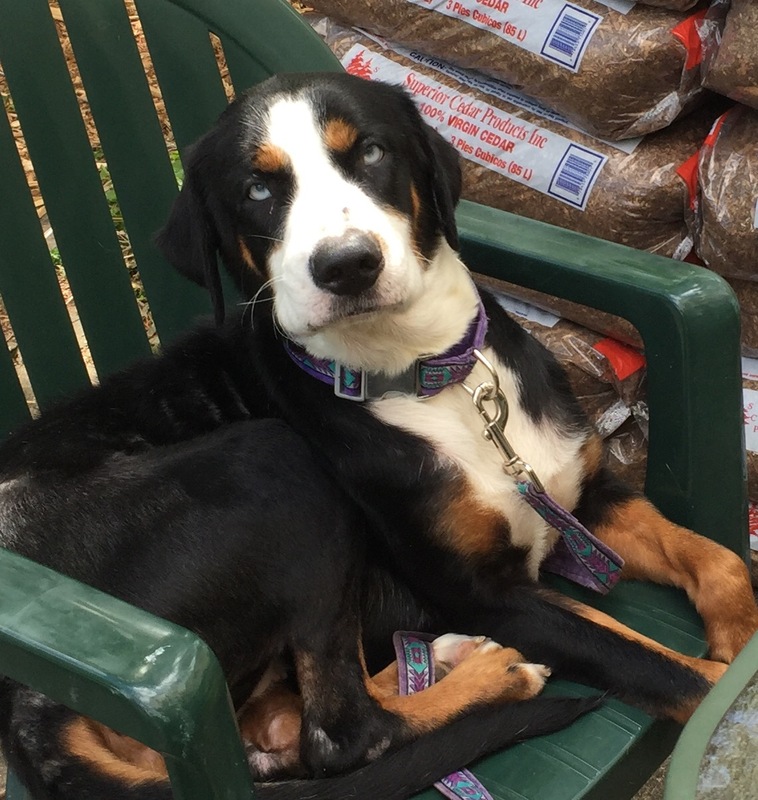 She has a blue eye and wide blaze, super outgoing, and a bit of an attitude. We think she will be more on the dominate side, and not afraid of anything, she will take on all the boys while playing. Koda, a 5 year old boy, was given up due to economics. 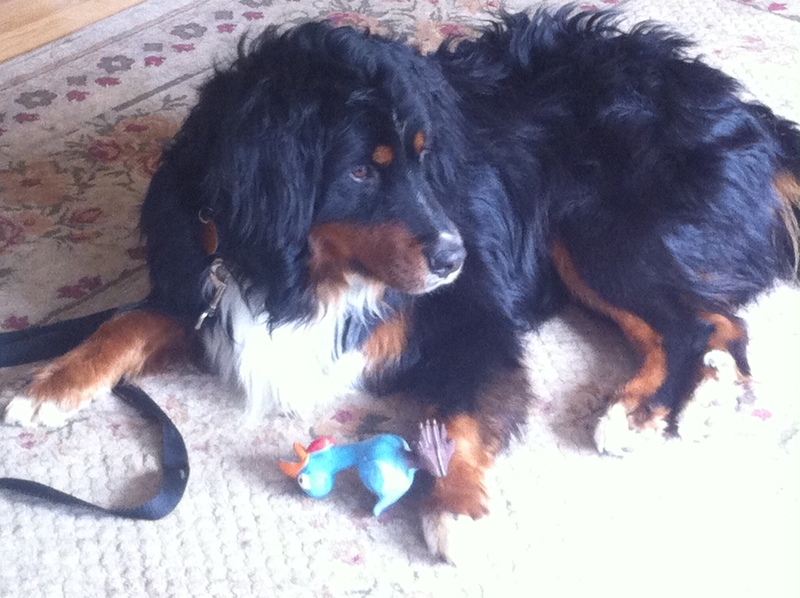 His owners could no longer afford to care for him with the loss of her job and a 33% cut to her husband’s wages. So they decided to contact us. 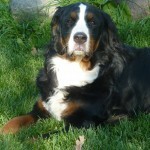 Koda is from the same miller/breeder as the last 4 and was sold at just 5 weeks old. 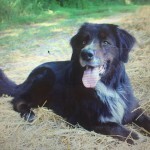 He is a little shy of new people and has some storm issues which we have not seen yet. He has done very well with people coming to our house. He is attached to Linda and follows her up to bed each night to sleep beside the bed. Gracie #3 is the product of a divorce. We have been in contact with the owner for several months, and were waiting until she had to vacate the home before her coming here. 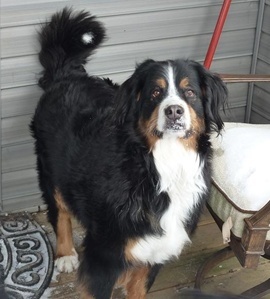 Gracie is a little over 4 years old, spayed and was purchased at a pet store in Waterford. She is a very nice girl with no issues, well trained and friendly. She has however, become very clingy after a week being here, and will not go outside without one of us. As of this writing, Gracie is going for home #3 (since she is Gracie #3, it might be a sign). 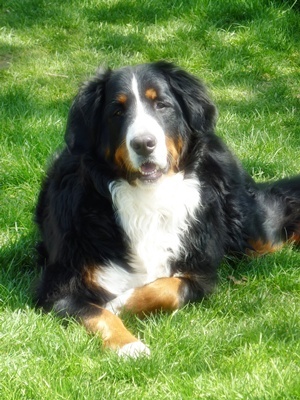 She is going to be going to her new home in Grosse Pointe Farms with former Berners owners and currently have a 10 year old lab. 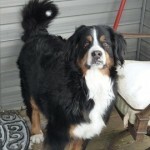 Gracie will also have a new 8 year old boy of her own to share life with. We expect this one to go through this time, they came and met her. Gracie made a ham of herself and the woman fell in love with her. He was a little more restrained as Gracie tried to do her best to get his suit pants covered with Gracie fur! (They stopped in during lunch from work) Gracie, really liked them. So she will go with her luggage she came with. 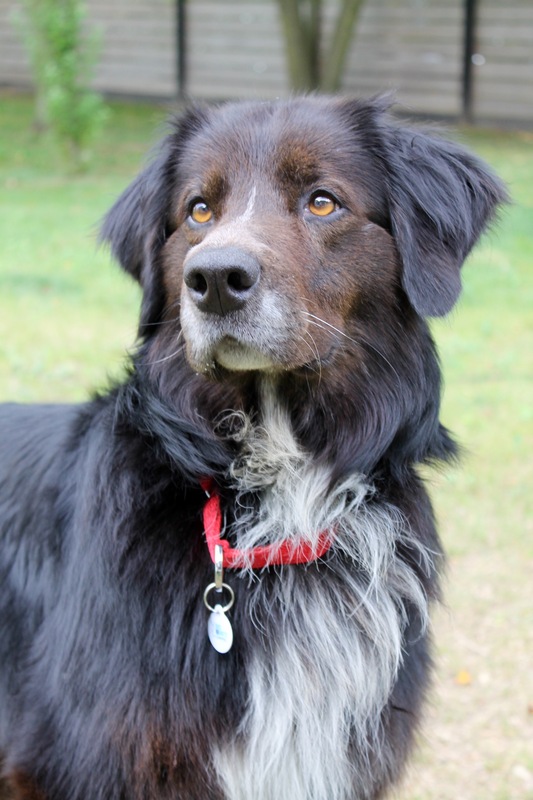 We were contacted about 2 dogs at shelters, one in Monroe and one in Cheboygan. The one in Monroe we lost out on. The one up north we were able to help somewhat. 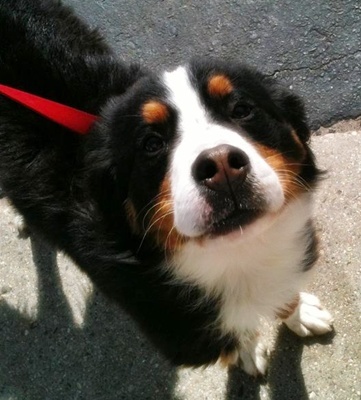 She was rescued by a couple in Lewiston that have another Berner. A big fenced yard and plenty of love to go around. 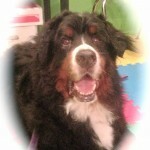 They have named her Brooke, she is an old girl and very neglected. She had several skin tags that were removed and tested. Unfortunately they came back as cancer. So they will make Brooke comfortable and give her whatever time she has left to learn what life is supposed to be like. She and her new sister, Skye are already playing and Brooke is acting like a pup now that she is free. 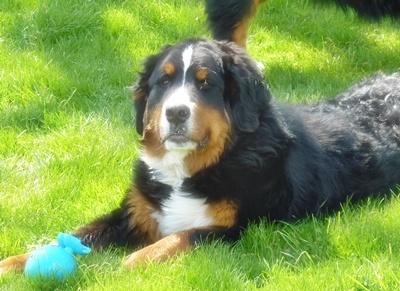 We hope that Brooke will have a long while to spend with her new family. Things over the last month have been a little unusual as far as placements go. We have had several adoptive homes fall apart just prior to the adoption. This has been for various reasons. Gracie’s first home I mentioned last report, which it fell apart the morning of writing the article. It fell apart again with another home the day she was supposed to go. 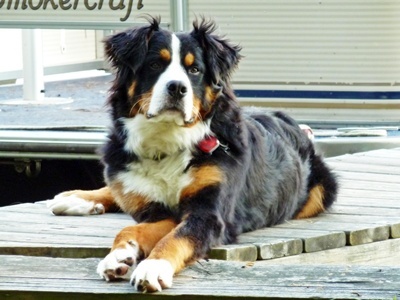 This time was because she was going to be a 2nd Berner for an elderly man that was hoping that Gracie would bring his Rocky out of his shell. Rocky is a BARC dog and has been very shy from day 1. 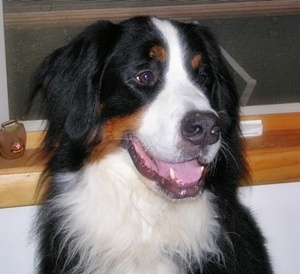 Rocky has made great progress in the 2-1/2 years he has been with his owner. He has been here several times and shown a ton of improvement. 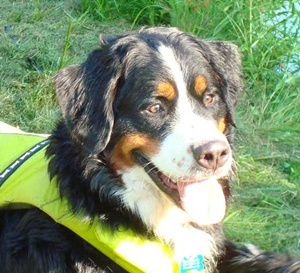 His owner decided that he wanted to work with just Rocky and that 2 might be too much for him, so he decided not to adopt. Ripley had a home set up and was ready to go too. 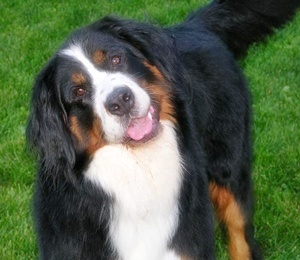 He home fell apart because it was just too soon after losing their last Berner, and felt that they were betraying their lost friend by getting another Berner. They decided a little more time for healing was needed. I think we all can understand the pain they are experiencing with their loss. Although being a little frustrating for us, we would much rather things not work out BEFORE placement rather than after. 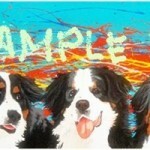 Then feelings of failure and they may feel obligated to a situation that is not right for either the family or the dog. Like Sadie, the 20 month from last month, we placed her in a home like Rocky above. 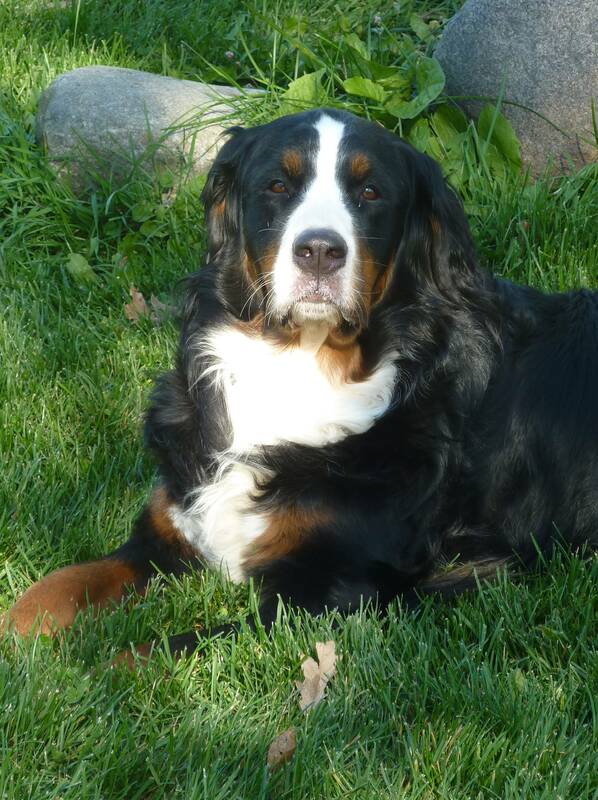 They have a shy Berner they got from rescue in Ohio. Abby is not a people orientated dog. She likes other dogs and will interact with people, but would rather sit in her safe spot and watch the world. So they adopted Sadie, and unbelievable people loving girl! 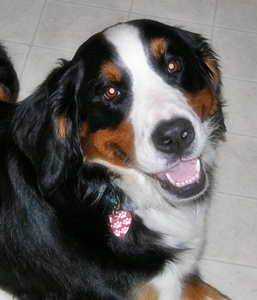 After seeing what a happy Berner is they realized how “damaged” Abby is. 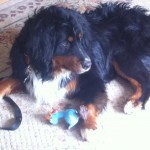 Sadie is the dog they dreamed about, friendly, outgoing, playful and very loving. The problem was compared to Abby she was too perfect (other than getting up several times a night to play) and Abby was getting pushed out. There was a point that they might consider keeping Sadie and giving up Abby. Yikes!! What have we done! I told them it was not fair to Abby to be replaced in such a way and would take Sadie back before I allowed them to give away Abby. Fortunately, they DO love Abby and want to give it more time to see if Sadie can teach Abby how to be more interactive. 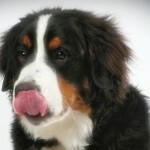 We also had to have some help in teaching the owners how to share their affections with both dogs at the same time. So as of now, everything is on a trial basis. We are keeping our fingers crossed that everyone learns to grow together for a happy family. 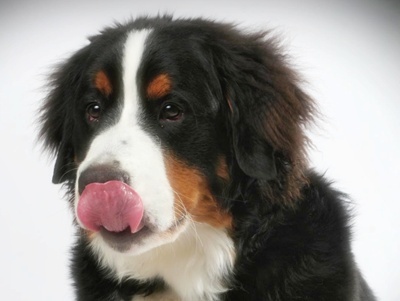 There have been several dogs listed recently on Craigslist list on the internet. 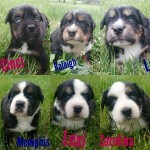 Also some on petfinder.com from other rescues in Michigan. We have not taken any of those in. We have offered. Either the rescues wanted to place them themselves or the owners wanted money for the dogs. We offered finding them homes but they wanted to re-coop some of their costs.